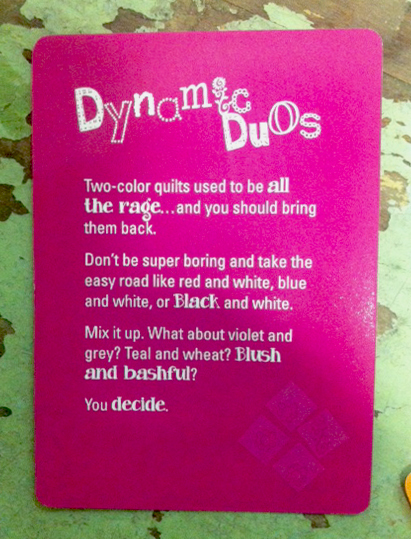 Ok quilters, this creative new card pack is about to add a whole new element of fun to your quilting! I had the pleasure of meeting Ebony Love, the inventor of this game, at market and she is such a doll. I was immediately inspired as she explained how her new Quiltspirations! worked. adorable, colorful pack of cards. is the name of the game you play with the cards. 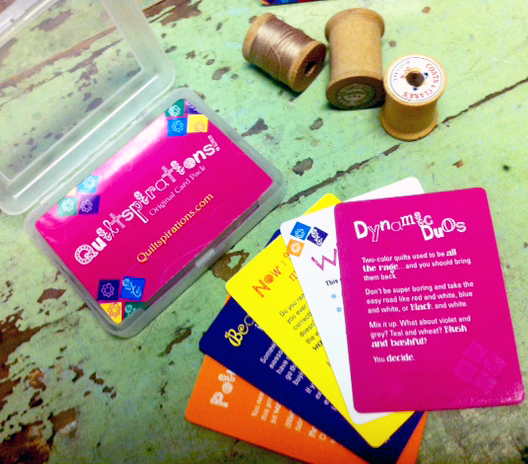 or you can sort the cards and pull an idea from each catagory for an entire project. You can play alone, or with a group of friends. This will be so fun for parties, retreats, guild challenges, round robins, black swaps & more! Colors, Shapes, Styles, Embellishments, Borders, Layouts and Whimsy. Pick a card, any card! And let the Quiltspiration begin. Can’t wait to get a group together and play! By Sarah CastanedaIn NotionsTagged Gifts, Quiltspirations4 Comments on Quiltspirations! Ebony is so amazing & I love these cards!! These are fantastic! I can’t wait to play! sounds so fun! what a great idea for a challenge or to jump start a new project.